The Sustainable Land Lab in St. Louis is one project featured on the new Legacy City Design Platform. As the urban planner leading the Detroit Future City planning process, I knew upon my arrival in the Motor City that part of my job was simply to believe that transformation was possible. To seriously address the city’s chronic issues of vacant land, blight and economic disparity, we had to be aspirational in our vision, yet practical in the strategies for managing change over time. As a result, we produced several planning and social innovations designed to help the Detroit community move beyond its image of abandonment to a vision of recovery, restoration and renewal, a vision rooted in making tough choices about how to move the city beyond its current condition, to one where today new investments in people and place are taking root in very visible ways throughout the city. While there is still much more work to be done in the new Detroit, I for one, am optimistic about its future and believe there are important lessons to be learned from our design process. In fact, many legacy cities, cities that have lost more than 50 percent of their population since their peak, are doing interesting and innovative design work. In 2013, the J. Max Bond Center on Design for the Just City (JMBC) at The City College of New York School of Architecture, where I am the director, along with The American Assembly and four other design centers, hosted the Bruner Loeb Forum on Legacy City Design, the first opportunity for design professionals working in or for these cities to interact and share information about how design interventions were working successfully or unsuccessfully in legacy cities. Coming out of that convening was a strong desire to stay connected to one another and have a more detailed portal to the many projects, programs, regulations and policies that were having a positive impact on the image of these cities. This week, in response to this charge, the JMBC launched the website for the Legacy City Design Network (LCD), www.legacycitydesign.org. The Legacy City Design network connects professionals working in legacy cities, shares successfully designed and implemented projects, hosts gatherings, advocates for innovative design, and develops new solutions through research and pilot project collaborations. The website is our signature platform for sharing innovative design practices happening in legacy cities. It seeks to inspire ideas and creative development for confronting a wide range of physical and socioeconomic challenges. This screen shot of Legacycitydesign.org shows the site’s catalogue of innovative design projects. Legacy City Design is already home to a robust online catalogue of design projects and research that practitioners, students, residents and advocates will be able to use to inform their own projects, and it is only growing. But to keep the site vital, fresh and current, we need you. 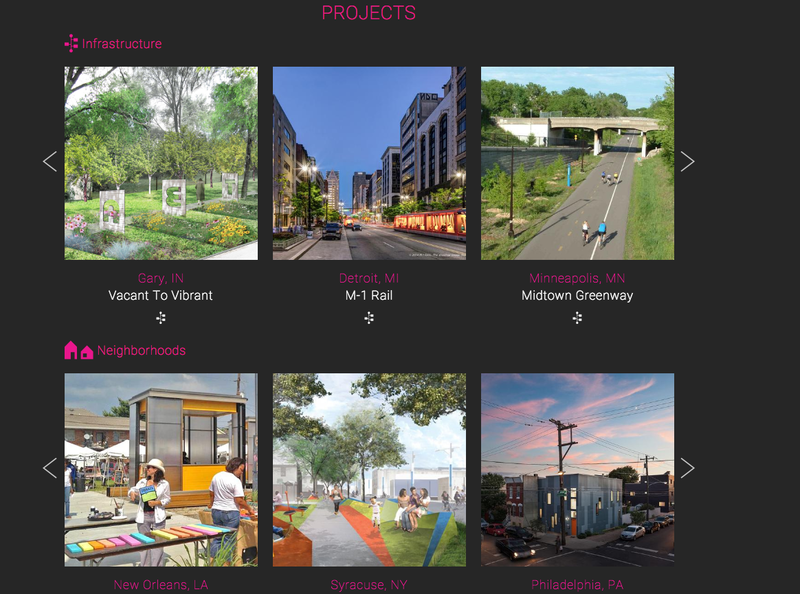 Tell us about projects in your community with our crowdsourcing tool and contribute to our catalog of local and national organizations working on design and policy in legacy cities. Use our interactive data maps to inform your work, and consult our bibliography of legacy city planning and design literature when you are looking to learn more. Tell us what we are missing. After all, legacy cities can only get better if we create, innovate, connect and share the lessons we learn in the process of urban transformation. The Legacy City Design platform was created in collaboration with Legacy Cities Partnership, a new alliance founded by the American Assembly, the Center for Community Progress, the J. Max Bond Center, and the Metropolitan Institute at Virginia Tech University, whose efforts are focused on supporting and empowering our nation’s former industrial core. To learn more about the Partnership and its framework for change, please visit the website at www.legacycities.org. Toni L. Griffin is the Director of the J. Max Bond Center on Design for the Just City at the City College of New York. Toni’s private practice, Urban Planning & Design for the American City, recently completed Detroit Future City, a strategic framework for urban regeneration.